1) Is it reasonable to take a travel trailer on South Eureka Road section from Big Pine to the dry camp? 2) Are there any good short day hikes in the area? 3) Any suggestions for other dunes that can be photographs. I have been to Mesquite Dunes and there are too many people there. 1. The dirt roads you would be driving over are usually wash boarded but otherwise in pretty good shape. 2 and 3. If you don't already have it, grab a copy of Michel Digonnet's book "Hiking Western Death Valley National Park." He describes some day hikes in the area. I highly recommend his hike to the Up and Down mine. And yes, there are some other dunes in the Eureka Valley, usually called the Hidden Dunes . He includes a description for those. BTW, here is a picture showing the Hidden Dunes with the Eureka Dunes in the background. The road in from Big Pine is paved to the bottom of Eureka Valley. The rest is maintained dirt. However, as mentioned, is often washboarded. South Eureka Road is also a bit rocky in spots. In winter and spring months, snow can also be a factor. The county will plow the road, but it might be two or more days after larger storms before they will get to it, as they focus on higher priority roads. In winter and spring there is nearly always pesent a road closed street barricade, one on those small folding kinds. The road may or may not be closed. Generally it means that you are travelling at your own risk. Keep an eye out for rocks and gravel on the pavement. Sometimes missing pavement. Around late March and early April the county will be grading the roads in Eureka Valley. That will make for smoother travel for your peace of mind, if you are willing to wait that long. However, after the roads are graded, watch out for unidentified flying objects. They are the city people who come out here to be impatient and travel over the freshly graded roads up to and over 75 mph in a cloud of dust and flying gravel, which is hazardous to the health of your windshield, headlights and front end paint. I know from experience - Numerous windshield chips, two windshield replacements, one headlight assembly and one signal light assembly. Absolutely do not miss the Hidden Dunes shown above! Take the side road into the middle of the Eureka Valley and an easy 3 mile hike to the Hidden Dunes. 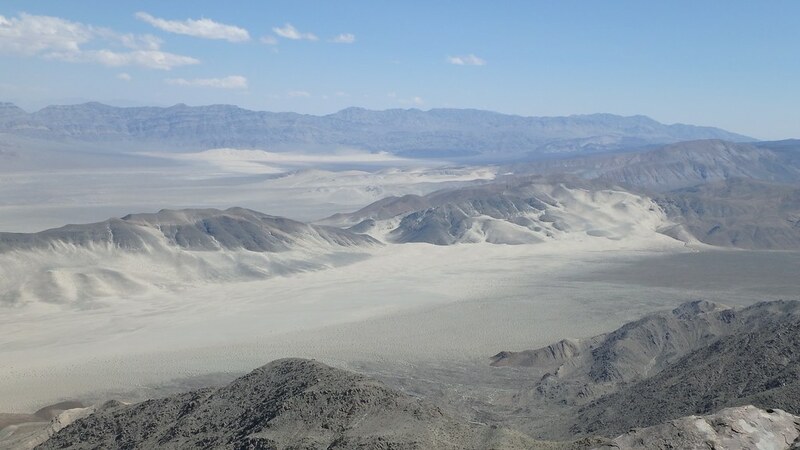 They are about a 1200 ft vertical gain from bottom to top (almost twice as much as the Eureka Dunes). On April 17, 2016, I got great views of the dunes, White Mountain Peak, and there was a lot of Eureka Dunes Evening Primrose. Hidden Dunes are really neat to see. If you head out early and no one is already there the dunes will be footprint free. You probably wouldn't be taking your trailer out there. Make it a day trip from Eurkea base camp. It's also a great place to camp. I have slept out there twice. Very peaceful. It's at the end of Dry Well Road. The turnoff is not marked and is easy to miss, especially driving south, so a good idea to get GPS coordinates. Yes in the right type of camper. Not sure I'd take a travel trailer out there to the well. One of my most memorable trips was coming into Eureka Valley at night. I was at the well around 1230AM. Made a quick camp with my popup and enjoyed a bit of the evening. Woke up early, had breakfast, then hiked to the dunes to do some photography. Had a snack sitting on one of the tallest dunes, purely enjoying the solitude. Hiked back to the truck, broke camp, then drove to Eureka and made camp again awaiting a friend who arrived that afternoon. It was the first day of a wonderful trip in Death Valley. I have always found the road out there to be pretty smooth aside from ruts requiring somewhat decent clearance. But I've only taken midsize SUVs out there.